Biochemical and Molecular Aspects of Selected Cancers, Volume I provides an overview of important topics and prototypes in cancer research. 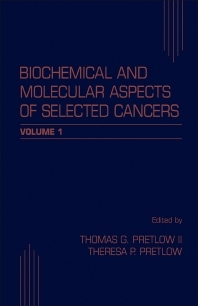 The book consists of papers provided by outstanding investigators in diverse disciplines in different areas of cancer research. This volume focuses on topics relevant to cancers in humans. It covers such topics as tumor-suppressor genes and human neoplasia; protein kinase C in neoplastic cells; and extracellular matrix interactions with tumor-progressing cells: tumor versus cell type-specific mechanisms. Structural and functional characteristics of human melanoma; steroid hormones and hormone receptors in neoplastic diseases; and patterns and significance of genetic changes in neuroblastomas are expounded as well. Oncologists, biochemists, cytologists, and other researchers in allied fields will find the book invaluable.